Green water in the Potomac River, caused by an overabundance of algal growth. In most cases, water takes on color as the result of organic matter from decaying vegetation. It is commonly a problem of surface water, and is rarely an issue for water from deep wells or springs. Color can also be a result of the presence of metals like iron and manganese. Yellow. Often referred to as “tannins,” indicates that humic acids are present. Reddish or reddish brown water indicates iron (rust). The red color may be found on bathroom fixtures and laundry. Blue or Bluish-Green usually indicates the corrosion of copper plumbing. Green water can also be caused by dezincification of bronze alloys. 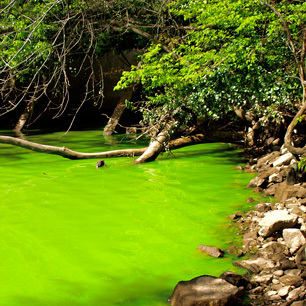 In warm climates, green water may be caused by algae from reservoirs or rivers. Milky white, cloudy or foamy water is usually caused by air released as the faucet is opened. Treatment of color varies. Activated carbon is the most commonly used color reducer. Anion exchange (usually following a water softener) is a common treatment for tannins, and certain types of macropore carbon are also effective at tannin removal. Iron and manganese coloration are treated in the standard ways that iron and manganese are treated. See sections on iron, manganese and copper for methods of reducing these contaminants and consequently the color alterations that they cause.